There has been much in the news over the past few years about antibiotic resistance, infections caused by bacteria that can’t be treated with traditional antibiotics. Antibiotic resistance is a concern to those who work with patients who have infections because infections can trigger sepsis. According to the World Health Organization (WHO), antibiotic resistance is an increasingly serious threat to global public health. Sepsis and septic shock can result from an infection anywhere in the body, such as pneumonia, influenza, or urinary tract infections. Worldwide, one-third of people who develop sepsis die. Many who do survive are left with life-changing effects, such as post-traumatic stress disorder (PTSD), chronic pain and fatigue, and organ dysfunction (organs don’t work properly) and/or amputations. Although historians have found evidence that people in ancient Rome and earlier used items that had antibiotic properties, the first antibiotic in modern medicine, penicillin, was discovered by Alexander Fleming in 1928. It was considered to be a wonder drug. Before penicillin became available, the simplest of infections could result in death. The drug was made widely available in the early 1940s, in time to save many soldiers in WWII who developed infections from battle wounds. However, even back then, Fleming cautioned that doctors use penicillin wisely, fearing that using it for too short a period or using too little of it may make bacteria mutate and become resistant to it. By 1947, his fear already came true and the first penicillin-resistant bacteria was found. After penicillin was discovered, scientists went on to discover several more, such as tetracycline (1944), erythromycin (1948), and ciprofloxin (1961), among others. Most bacteria that we are exposed to every day are harmless. They are everywhere, including on our skin, and in our mouth and gut. But some bacteria are harmful if they get inside the body, where they cause an infection, which can lead to death if left untreated. For example, before antibiotics were developed, strep throat could be a fatal disease, and up to 90% of children who developed bacterial meningitis died. 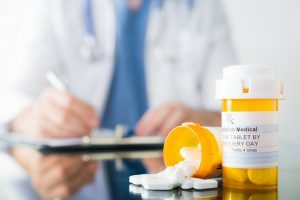 Antibiotics treat or stop infections in one of two ways: they either kill the bacteria outright or they stop their ability to reproduce, so that they stop spreading and causing further harm. If an illness is caused by a virus or a fungus, antibiotics have no effect and cannot treat the illness, although there are anti-viral and anti-fungal drugs available. (Sepsis and Viral Infections), Sepsis and Fungal Infections) As a group, all of these drugs are referred to as anti-microbial agents or anti-microbial drugs. Not all types of antibiotics can kill all types of bacteria, so researchers continue to look for newer and better antibiotics to try to treat all types of infections. The most commonly known “superbug,” or antibiotic-resistant bacteria is MRSA, methicillin-resistant Staphylococcus aureus, first found in 1961. As the years passed, MRSA became resistant to the most commonly used antibiotics: penicillin, methicillin, tetracycline, and erythromycin. A newer drug, vancomycin, did treat MRSA, but it was expensive and doctors tried to use vancomycin sparingly to reduce the risk of MRSA mutating again. In 2002, VRSA – vancomycin-resistant Staphylococcus aureus, was found. Enterococcus, a common cause of urinary tract infections, often becomes resistant to vancomycin and is called vancomycin resistant Enterococcus or VRE. The race for new antibiotics continues, but there is a real concern that bacteria will mutate that we don’t yet have a treatment for. The need to educate people about the proper use of antibiotics is essential. As Fleming predicted with penicillin, using too little or too short a course of antibiotics for a specific infection can result in bacteria mutating and becoming resistant. The reverse can happen as well – resistance can result from antibiotics being used for longer than necessary. In addition, using any type of antibiotic inappropriately, such as taking one to treat a viral infection, or not taking a prescription properly, can also cause superbugs to develop. Everyone, from the general public to healthcare professionals have a role to play in reducing antibiotic resistance. Never taking an antibiotic prescription that was not prescribed for you. In other words, don’t take a relative’s or friend’s antibiotic because you think you may have the same infection. Completing your prescription as directed, including number of times of day, the correct dosage, in the correct way, for the full length of time, regardless of how well you may feel. Practicing infection prevention, by thorough and frequent hand washing, avoiding people who have infections, and getting recommended vaccinations. The treatment for sepsis is antibiotics and fluids, among other therapies. Sepsis experts are worried about antibiotic resistance. They support measures to prevent resistance, because controlling infection with appropriate antibiotics is the cornerstone of sepsis treatment. Without adequate antibiotics to treat patients, the future of sepsis care would be grim. We must slow down the growth of superbugs so that we can successfully continue to treat bacterial infections and save lives of those who have sepsis.